Download videos from Google Video, YouTube into Mac, PC, iPod video, PSP & Treo - for free! A pretty working tool to download & convert videos from YouTube, Google Video and iFilm to your Mac and PC into AVI, FLV and MP4 (iPod & PSP!) and Palm Treos as well! Every single moment a nice idea comes alive on the web. This is useful too: a website that enables anyone to convert a video available on one of the most popular video sharing systems around, namely YouTube, Google Video and iFilm, and save it directly to your PC (or Mac!) into three different video formats. - copying the video URL directly into the second textbox. The first way will give you results you'll be using later. Let's see what happens for a simple search: let's look for guy kawasaki, a well-known guy in the Mac-world and Venture Capitalist guru, among other things. The result page should be this bringin up the Guy Kawasaki presentation in several video formats . The advantage is clear: you can watch videos without downloading/installing flash players or Google Video Player (available for PCs and Macs) and have your favorite videos converted for iPods, PSP and any other portable device as well: for free! It's just a matter of downloading them from googlevideodownload.com website (so it's up to your internet connection speed) and you've got a stand-alone copy of these videos on your hard disk. 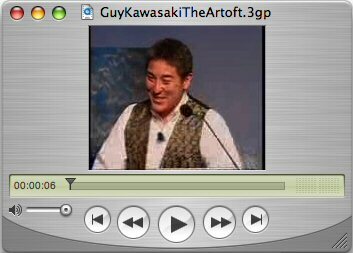 File size matters: the Guy Kawasaki presentation it's about 300 MB for GVI (Google Video format) and stays the same (same encoding?) in .AVI format; it goes down to 174 MB in .MP4 format. Palm Treo video playback support! We still love & use our Treo 650 and, even though it lacks stereo headsets and a huge screen it's still enough to see some pod/videocasts or to show some friends videos. Interested? Here's how we did! Download the MP4 version of your favorite video and open it with Quicktime 7 Pro (you may try some other free video converters too). Export video to .3GP, a common cell phones video format, and then copy it onto your Treo. Our Treo 650 is using a 1 GB Sandisk SD card, so file transfer it's quite easy this way! Again, the Guy Kawasaki video shrinks to a mere 22 MB fitting perfectly the SD card and leaving room for a lot of videos. As a result we're able to pass the video on any device: from the Powerbook G4 to Windows XP, to a DiVX player, to an iPod or PSP and to a Treo 650 too! Kudos to the guys at googlevideodownload.com! BTW: please keep in mind that some video content may have copyright or stuff like that so check out before sharing them.